Marking the beginning of the cricket mania that is set to engulf fans all over the country today onwards, Mobilink Jazz is geared to revive faith and winning spirit we all need – a little faith can go a long way in motivating Pakistan’s cricket team. To kick start the revolution and have some youthful fun, Jazz brings the thrilling contest titled Kitna Hai Jazba? You have this thing called Mobiphobia where you are blinded by every other campaign of Mobilink and think of it as the best where the reality is stinking in the opposite direction. Secondly girls aren’t into cricket, get a Barbie. umm… what a sexist comment..
Its cricket!! Who doesn’t love cricket? You may go purchase a barbie to get over your insecurities. 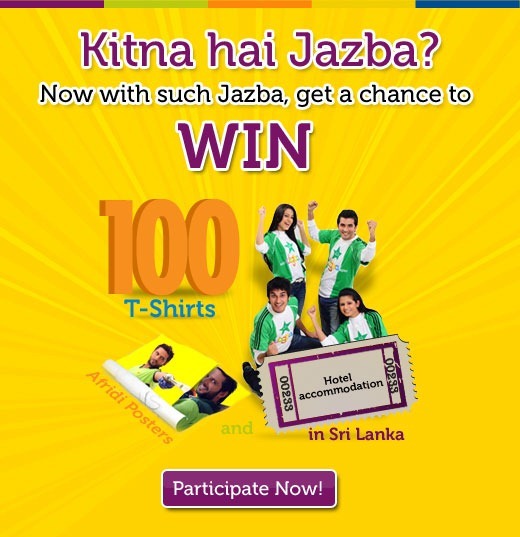 And as for Mobilink, it is offering a contest, where one could win prizes. If you do not wish to participate, do not leave unnecessary and bogus comments. ooo heated discussion on the table..
anywayyysss.. can anybody please tell me when are the results going to be announced?? A trip to Siri Lanka! I think i am late as i see it was posted on 17 feb! Still any chance if i win? jitna jazba tha pakistan main wo ……….